24-hour forecast: Sunny with cloudy spells today and cloudy at times tonight. A few showers and isolated thunderstorms will affect the south and coast this morning and tonight and inland areas this afternoon. General Outlook: A similar trend will occur on Thursday and Thursday night. Daily Tropical Weather Outlook: At 3:00am,Tropical Storm Ophelia was centered near 30.2N 37.0W or about 785 miles Southwest of the Azores. Today E-NE 5-15 kts Light Chop 1-2 ft A FEW SHOWERS AND ISOLATED THUNDERSTORMS, DECREASING. 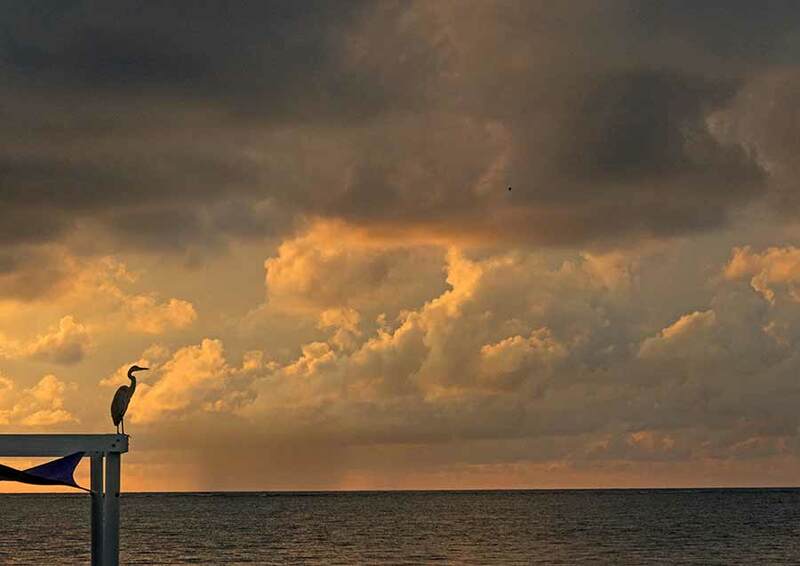 Tonight E-NE 5-15 kts Light Chop 1-2 ft A FEW SHOWERS AND ISOLATED THUNDERSTORMS. Tomorrow E-NE 5-15 kts Light Chop 1-2 ft A FEW SHOWERS AND ISOLATED THUNDERSTORMS, DECREASING. Outlook NE 5-15 kts Light Chop 1-2 ft THURS NIGHT: A FEW SHOWERS AND ISOLATED THUNDERSTORMS. Last edited by Marty; 10/12/17 06:13 AM. How nice to find no threatening tropical systems on the map today. love it. On Ambergris Caye this morning we have thunder showers an a wind from the East - NE at 6 mph. The sea is calm. what a fabulously beautiful photo!!! Even got the bird! A fairly large ITCZ swell-up last night developed near southern Belize and moved up over the country and now moved to the west into Guatamala, but it has caused a lot of rain in many parts, perhaps most parts of Belize over night. Right now, still some in parts of central Belize and a little in northern areas, but reducing. 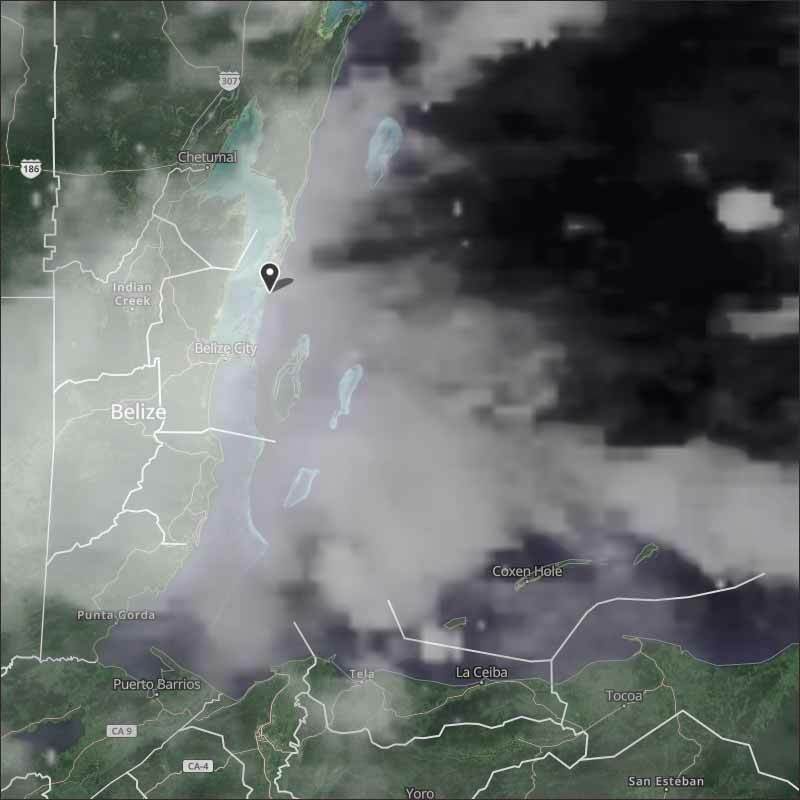 The low cloud in central Belize is from the West, but the rain carrying cloud is regular easterly Caribbean winds. There are still small swell-ups developing. 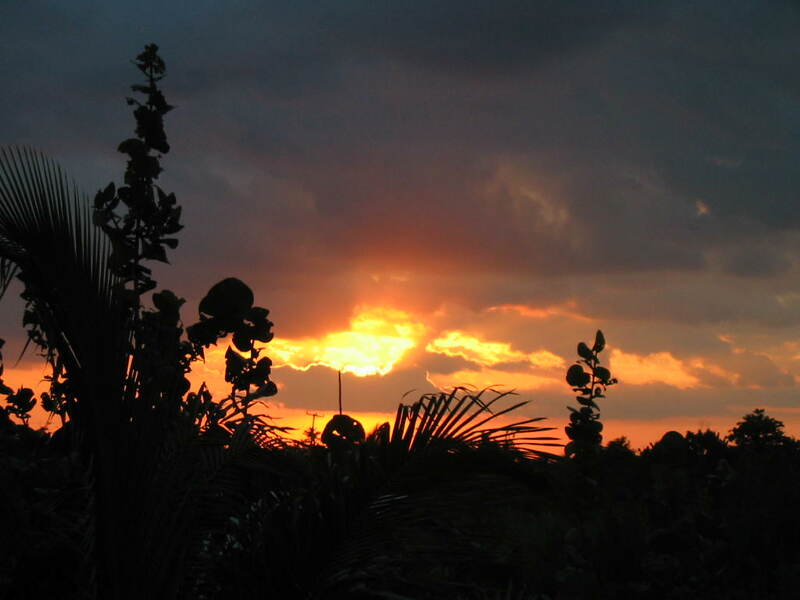 Looks like this morning will be overcast, still with patches of rain, perhaps some sun this afternoon. 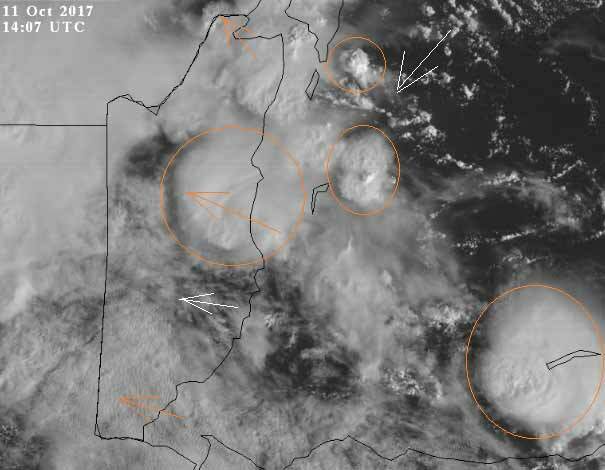 The main swell-up has moved into Guatamala, there is still a significant one over east central Belize and Belize city, but there are several small swell-ups developing right now out at sea. There is chunky cloud coming down from the NE, and low cloud from the SW near Belmopan, but the rain has been moving from the east as with the regular Caribbean wind direction.